In Quebec and elsewhere in Canada and even in North America the home theater is a dream for many homeowners. The winters are long and cold and one does not always feel like going to the cinema. A home theater allows therefore, while remaining at home, to have a superior quality of atmosphere, image and sound than a TV show on a large normal screen in the sitting room. 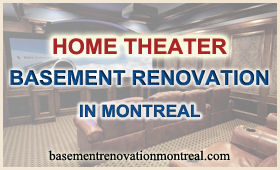 The entrepreneurs and professional interior designers of the Basement Renovation Montreal Group take care of the renovation of a portion of your basement into a dream home theater. do not forget space for a popcorn machine! An expert of the Basement Renovation Montreal Group works with an electronic equipment supplier to build the theater room in the basement according to dimensions and characteristics ideal for obtaining a good movie theater performance at home. The Basement Renovation Montreal team, if such would not already be the case, advises and supports you in the purchase of electronic equipment and takes care of the house cinema project from beginning to end introducing to you: an interior designer, a cabinetmaker, a furnishings designer, and some reputed general contractors in basement finishing licensed in home renovation. The home theater you have dreamed so much about is now possible with the team of specialists: an interior designer, an engineer, a sound-systems specialist and general contractors in finishing of the Basement Renovation Montreal Group.